The Deadlift Package Featuring the XMark VOODOO Commercial Olympic Bar, Hard Chrome with Black Manganese Phosphate shaft, 185,000 PSI and 280 lbs. of XMark Superb Quality Olympic Bumper Plates by XMark at Strongman Pictures. MPN: VOODOO-3385-280S. Hurry! Limited time offer. Offer valid only while supplies last. The Deadlift package includes the XMark VOODOO Olympic Bar and 280 lbs. of Olympic Bumper Plates (a pair of 10 lb. plates, 35 lb. plates, 45 lb. The Deadlift package includes the XMark VOODOO Olympic Bar and 280 lbs. of Olympic Bumper Plates (a pair of 10 lb. plates, 35 lb. plates, 45 lb. plates, and 2 pair of 25 lb. plates). Crafted using a heat treated alloy steel and a snap ring lock system, the VOODOO bar features superior tensile strength of 185,000 PSI with moderate flex and a 1500 lb. weight capacity. Features a black manganese phosphate shaft which is used only in high quality bar. Manganese phosphate coatings are the hardest providing unbeatable corrosion and abrasion protection. 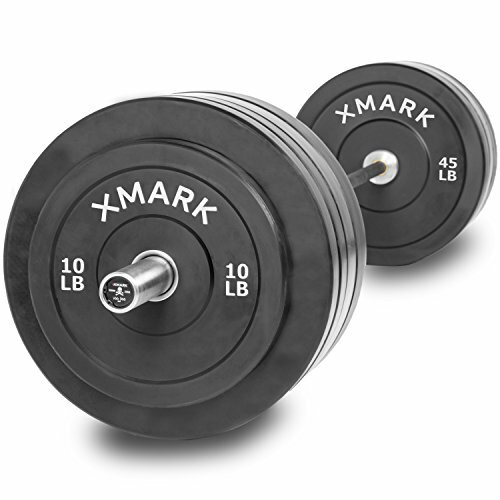 The XMark Olympic bumpers, designed with a 2" stainless steel insert allowing olympic bars to fit snugly, are encased in 60% recycled rubber coupled with synthetic rubber for added tensile strength. Addressing the industry wide issue of 10 lb. bumper plates warping when repeatedly dropped, we've decreased the diameter of our 10 lb. plates to 13 3/4" while the depth has been increased to 1 5/8". Note: collars not included. The Deadlift package includes the XMark VOODOO Olympic Bar and 280 lbs. of Olympic Bumper Plates (a pair of 10 lb. plates, 35 lb. plates, 45 lb. plates, and 2 pair of 25 lb. plates). Collars not included. Crafted using a heat treated alloy steel and a snap ring lock system, the VOODOO bar features superior tensile strength of 185,000 PSI with moderate flex and a 1500 lb. weight capacity. Features a black manganese phosphate shaft which is used only in high quality bar. Manganese phosphate coatings are the hardest providing unbeatable corrosion and abrasion protection. The XMark Olympic bumpers, designed with a 2" stainless steel insert allowing olympic bars to fit snugly, are encased in 60% recycled rubber coupled with synthetic rubber for added tensile strength. Addressing the industry wide issue of 10 lb. bumper plates warping when repeatedly dropped, we've decreased the diameter of our 10 lb. plates to 13 3/4" while the depth has been increased to 1 5/8".